Chip Sperry’s remarks on the rules for Suiseki at the November general meeting got me to thinking. The Japanese are telling us that in order to be a real Suiseki, it has to be dark in color and a hard stone. Well, naturally! They live in a volcanic country, and if they think all rocks should be dark, we shouldn’t find basalt with that! Or should we? He mentioned he had heard that some are saying that, to be a suiseki, it had to be bought from Japan. Hey, if I like my rock and it makes me happy, and I want to call it “Suiseki”, that’s my business. There are a lot of lighter-colored, maybe softer stones in the world and it is our happy lot to appreciate them, even if they are limestone or sandstone. In the case of the Grand Canyon, especially if they are sandstone. Fundamentally, our hobby is about the pursuit of natural beauty, and we shouldn’t fence ourselves in with silly rules to the point that we forget it. John Naka used to say that, as he got older, his interest turned in the direction of suiseki, because rocks don’t die. Another nice thing about rocks: the style is either there, or we wouldn’t pick it up in the first place. 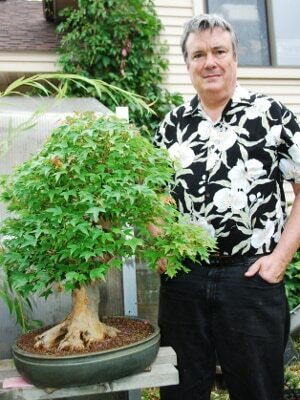 As bonsai hobbyists, we are hard up against the fact that most of us just aren’t stylists.